Plastics are the most widely used materials in the world. These offer better weight to strength ratio when compared to traditional materials such as metals, wood, and glass. Rapid development in the plastic industry have made plastics capable of withstanding high pressure, and temperature situations, which makes it a material of choice for a variety of industrial applications. Extrusion is a technology used for converting plastic materials to manufacture pipes, films, tubes, sheets, and various other products for industrial applications. In this process, a material is designed by forcibly pushing it through a tool that eventually shapes it. Plastics of all types such as, high-density polyethylene, low-density polyethylene, polypropylene, and polystyrene are appropriate for extrusion as they are easily malleable. Low-density polyethylene exhibits exceptional uniformity and consistency in its dimensions. Extruded plastic products can be manufactured in infinite lengths and shapes. The extruded plastics market is expected to grow in the forecasted period due to increasing demand from applications such as packaging, building & construction. Extrusion is used to manufacture plastic films, tubes, pipes, sheets, and others. The key factors driving the specialty fertilizer market across the globe are growth in end-use industries, increase in usage of plastics in agriculture. Rise in preference of people for ready-to-eat food is anticipated to fuel the packaging industry. This, in turn, is anticipated to boost the extruded plastics market. According to statistics published by the International Organization of Motor Vehicle Manufacturers (OCIA), the global automotive production increased 4.5% between 2015 and 2016. This rise in production is anticipated to drive the demand for extruded plastic products in the automotive industry. Consumption of plastics in agriculture is low in emerging economies such as India. The Government of India is striving to increase the consumption of plastic in agriculture applications. For instance, the agriculture ministry of India plans to introduce micro irrigation system in 17 million hectares of land over the next three years. This is estimated to boost the extruded plastics market in the country. In terms of type, the extruded plastics can be classified into LDPE, HDPE, polypropylene, polystyrene and PVC. Low density polyethylene (LDPE) is a polyolefin material which has high molecular weight. It is a non-toxic material with high degree of break resistance. It is resistant to a large number of laboratory chemical and is easy to fabricate. These properties together make LDPE a material of choice for packaging manufacturers. In terms of the forms, the extruded plastics market can be classified on the basis of films, pipes, sheets, tubes, wires & cables and others. The film segment dominated the global extruded plastics market due to excessive use of films in the packaging application. While pipes segment is anticipated to grow at the significant growth rate in the near future. 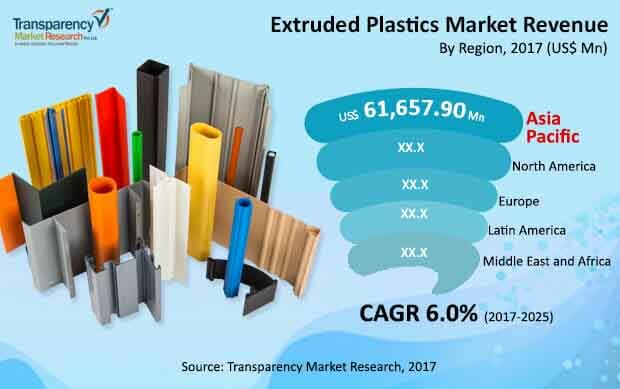 In terms of the application, the extruded plastics market can be classified on the basis of packaging, building & construction, automotive, energy, electrical & electronics, medical, and others. The packaging segment dominated the global extruded plastics market due to increased demand of packaged food across the globe. While medical segment is anticipated to grow at the significant growth rate in the near future. In terms of region, the extruded plastics market can be classified into North America, Europe, Asia Pacific, Middle East & Africa, and Latin America. Asia pacific dominates the market for extruded plastics in terms of demand and revenue, followed by North America and Europe. Middle East & Africa is anticipated to be the fastest growing market for extruded plastics. Consumption of extruded plastics in India is still at an emerging stage. The increasing awareness about the benefits of extruded plastics is projected to raise the demand for extruded plastics. Increasing use of extruded plastics in agriculture is anticipated to fuel the growth for the extruded plastics market. Key players operating in the global extruded plastics market Berry Global Inc., Sealed Air Corporation, Formosa Plastics Corporation, Saudi Basic Industries Corp., and Sigma Plastics Group and others. This report analyzes and forecasts the market for extruded plastics at the global and regional level. The market has been forecast based on revenue (US$ Mn) and volume (Kilo Tons) from 2017 to 2025. The study includes drivers and restraints of the global extruded plastics market. It also covers the impact of these drivers and restraints on demand for extruded plastics during the forecast period. The report also highlights opportunities in the extruded plastics market at the global and regional level. The report comprises a detailed value chain analysis, which provides a comprehensive view of the global extruded plastics market. Porter’s Five Forces model for the extruded plastics market has also been included to help understand the competitive landscape in the market. The study encompasses market attractiveness analysis, wherein applications are benchmarked based on their market size, growth rate, and general attractiveness. The study provides a decisive view of the global extruded plastics market by segmenting it in terms of type, form, and applications. These segments have been analyzed based on present and future trends. Regional segmentation includes the current and forecast demand for extruded plastics in North America, Europe, Asia Pacific, Latin America, and Middle East & Africa. The report also covers demand for individual type, form, and applications in all the regions. The study includes profiles of major companies operating in the global extruded plastics market. Key players in the extruded plastics market include Berry Global Inc., Sealed Air Corporation, Formosa Plastics Corporation, Saudi Basic Industries Corp., and Sigma Plastics Group, among others. Market players have been profiled in terms of attributes such as company overview, overall revenue, business strategies, and recent developments. The report provides the estimated market size of extruded plastics for 2016 and forecast for the next eight years. The global market size of extruded plastics has been provided in terms of revenue and volume. Market numbers have been estimated based on type, form and applications segments of extruded plastics market. Market size and forecast for each major type, form and applications have been provided in terms of global and regional markets. Secondary research sources that are typically referred to include, but are not limited to company websites, annual reports, financial reports, broker reports, investor presentations, and SEC filings, internal and external proprietary databases, and relevant patent and regulatory databases, national government documents, statistical databases, and market reports, news articles, press releases, webcasts specific to companies operating in the market, American Chemical Society, International Council of Chemical Associations, and European Union. Primary research involves e-mail interactions, telephonic interviews, and face-to-face interviews for each market, type, and applications across geographies. We conduct primary interviews on an ongoing basis with industry participants and commentators in order to validate the data and analysis. Primary interviews provide firsthand information on market size, market trends, growth trends, competitive landscape, and outlook, etc. These help validate and strengthen secondary research findings. These also help develop the analysis team’s expertise and market understanding.